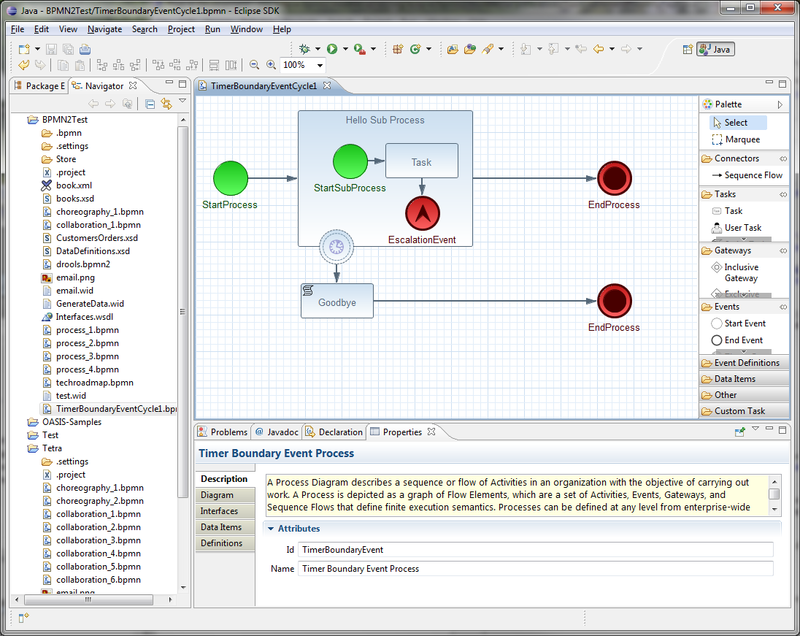 The Eclipse BPMN 2.0 Modeler allows you to specify business processes, choreographies, etc. using the BPMN 2.0 XML syntax (including BPMNDI for the graphical information). 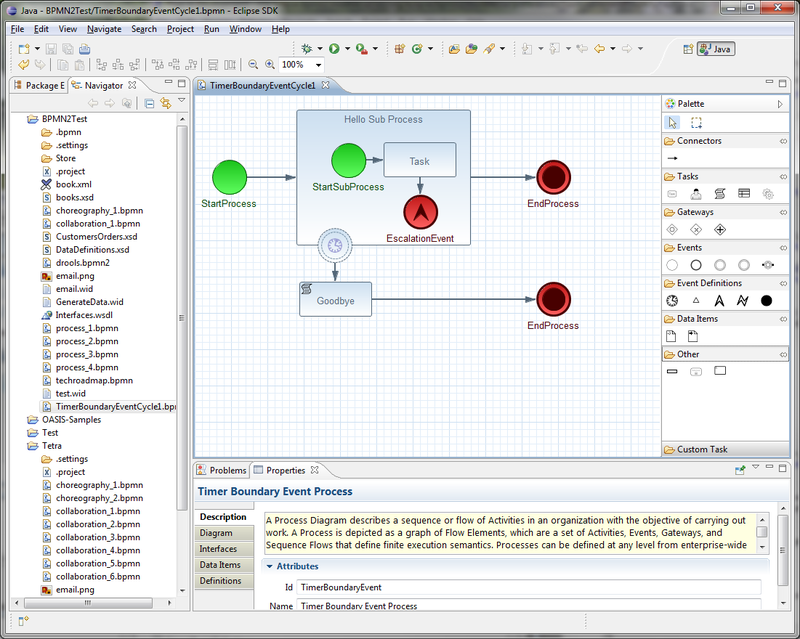 The editor itself is based on the Eclipse Graphiti framework and the Eclipse BPMN 2.0 EMF meta-model. It supports almost all BPMN 2.0 process constructs and attributes (including lanes and pools, annotations and all the BPMN2 node types). Added additional support for the few custom attributes that jBPM introduces using a special jBPM Target Runtime. Allows you to configure which elements and attributes you want use when modeling processes (so we can limit the constructs for example to the subset currently supported by jBPM, which is a profile supported by default, or even more if you like). The BPMN2 Modeler project is being developed at eclipse.org, sponsored by Red Hat/JBoss. Red Hat understands the benefits of developing software in the community, and therefore, the Eclipse BPMN 2.0 Modeler was developed not just for the jBPM project only, but it can be used in a much broader context and is fully spec compliant. jBPM-specific features are developed as part of a separate jBPM Target Runtime. We welcome other organizations in contributing to this modeler as well and (re)using the generic functionality and/or defining their own target runtime if necessary. Not only is this a good thing for the community, but it also leaves the path open for the jBPM suite to evolve as new features are requested by customers. Many thanks go out to the people at Codehoop that did a great job in creating a first version of this editor. The jBPM installer is capable of downloading and installing an Eclipse installation, including the Eclipse BPMN2 Modeler and the Drools and jBPM Eclipse plugin (with a full jBPM runtime preconfigured). Here are some screenshots of the editor in action.